3 Sea Otters A sea otter! One of two otters that live in Alaska. The other otter is a river (or land) otter, which unlike a sea otter, spends a lot of time on land. Also, a river otter is half the size of a sea otter. The light (almost white) head gives the sea otter away. Both are in Glacier Bay, but this sea otter you see in front of you has a unique story to tell you about living in Glacier Bay. 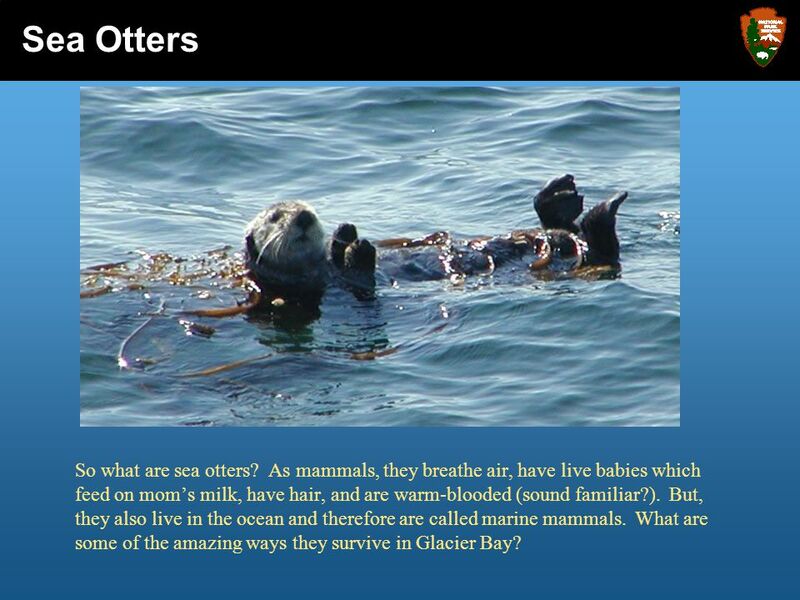 4 Sea Otters So what are sea otters? As mammals, they breathe air, have live babies which feed on mom’s milk, have hair, and are warm-blooded (sound familiar?). But, they also live in the ocean and therefore are called marine mammals. What are some of the amazing ways they survive in Glacier Bay? 5 Sea Otters They have webbed hind feet that propel them through the water. Thick fur keeps them warm, as they don’t have the blubber (fat) that whales and seals have. Their stream-lined body shape allows them to soar through the water like an eagle would through the sky. This allows them to do everything in the water. 6 Sea Otters Sea otters dive, eat, sleep, play, and even give birth to their babies in the water! Everything they need to survive in Glacier Bay is in the ocean. 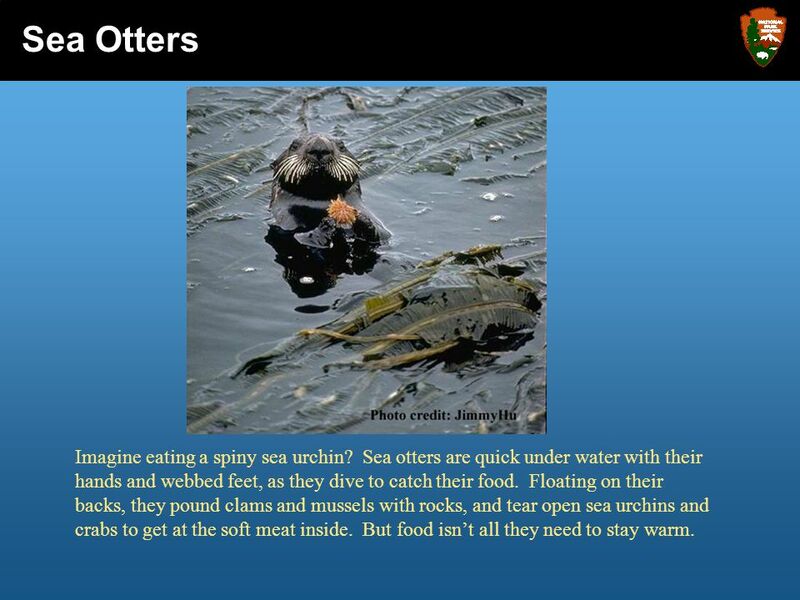 While we need a snorkel, fins, and a warm, dry scuba suit, otters have all their own gear and even find lunch on the go! It may seem like otters have an easy life, but wait ‘til you see what they need to do EVERY day! 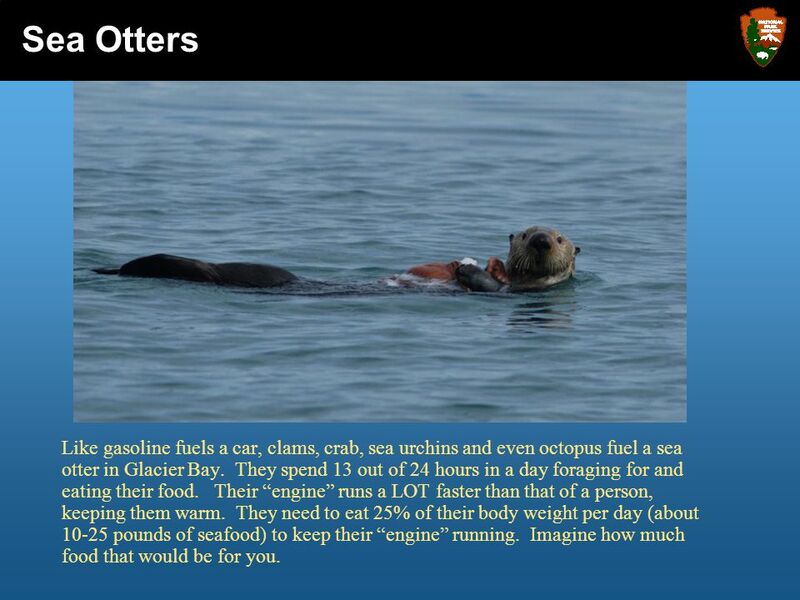 7 Sea Otters Like gasoline fuels a car, clams, crab, sea urchins and even octopus fuel a sea otter in Glacier Bay. They spend 13 out of 24 hours in a day foraging for and eating their food. Their “engine” runs a LOT faster than that of a person, keeping them warm. They need to eat 25% of their body weight per day (about pounds of seafood) to keep their “engine” running. Imagine how much food that would be for you. 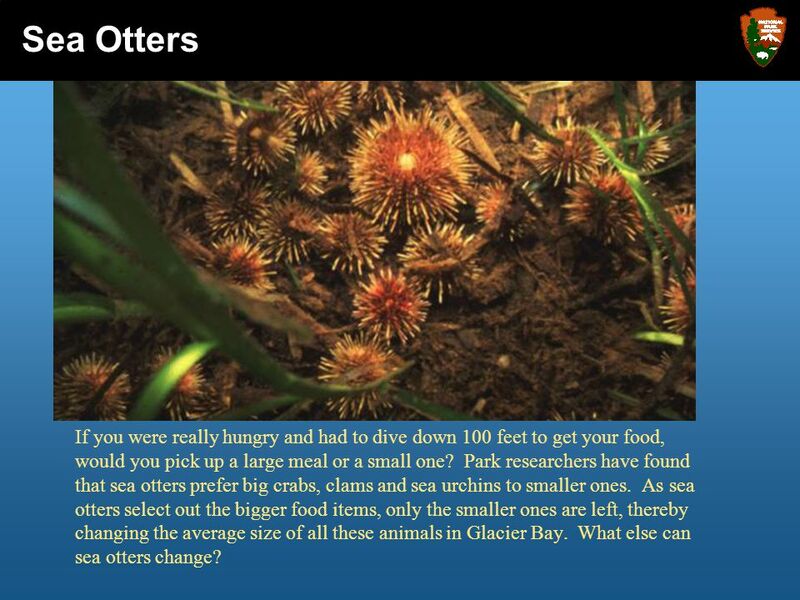 8 Sea Otters Imagine eating a spiny sea urchin? 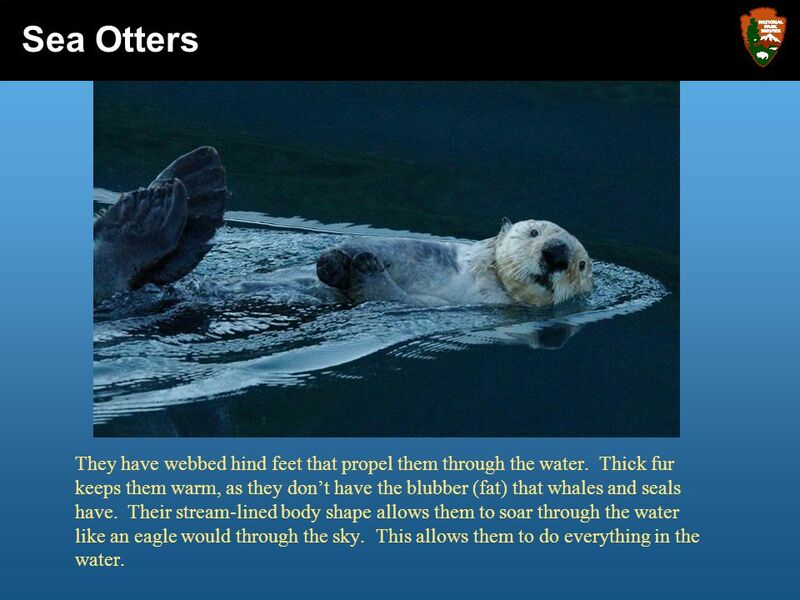 Sea otters are quick under water with their hands and webbed feet, as they dive to catch their food. Floating on their backs, they pound clams and mussels with rocks, and tear open sea urchins and crabs to get at the soft meat inside. But food isn’t all they need to stay warm. 9 Sea Otters In Glacier Bay, the water temperature is about F, which for us is REALLY cold. Sea otters don’t have a lot of body fat (blubber) like seals and whales, but they do have very thick fur (the thickest of any animal in the world!). 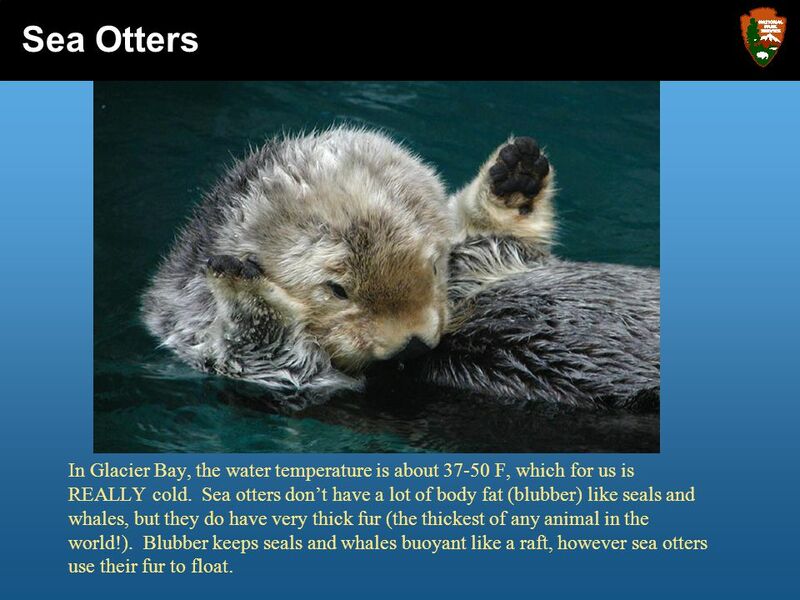 Blubber keeps seals and whales buoyant like a raft, however sea otters use their fur to float. 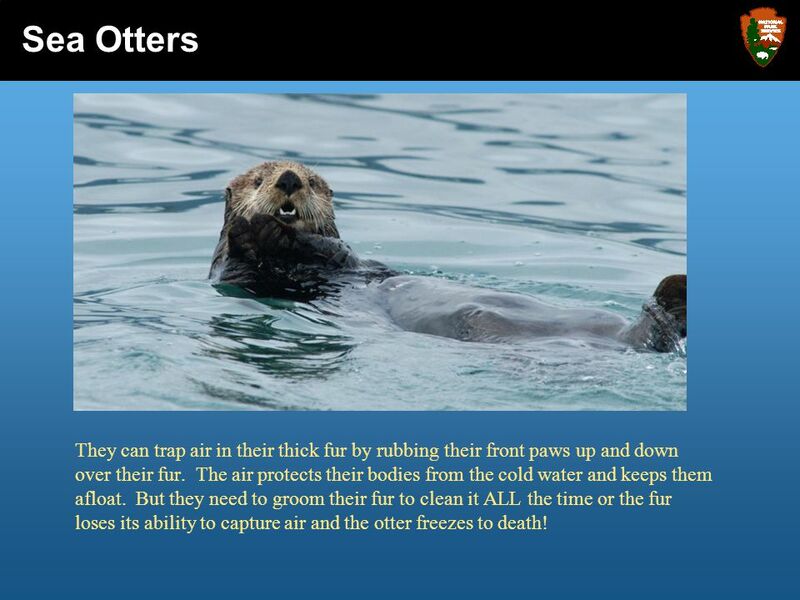 10 Sea Otters They can trap air in their thick fur by rubbing their front paws up and down over their fur. The air protects their bodies from the cold water and keeps them afloat. But they need to groom their fur to clean it ALL the time or the fur loses its ability to capture air and the otter freezes to death! 11 Sea Otters If you just ate 20 pounds of seafood, wouldn’t you feel a little tired? 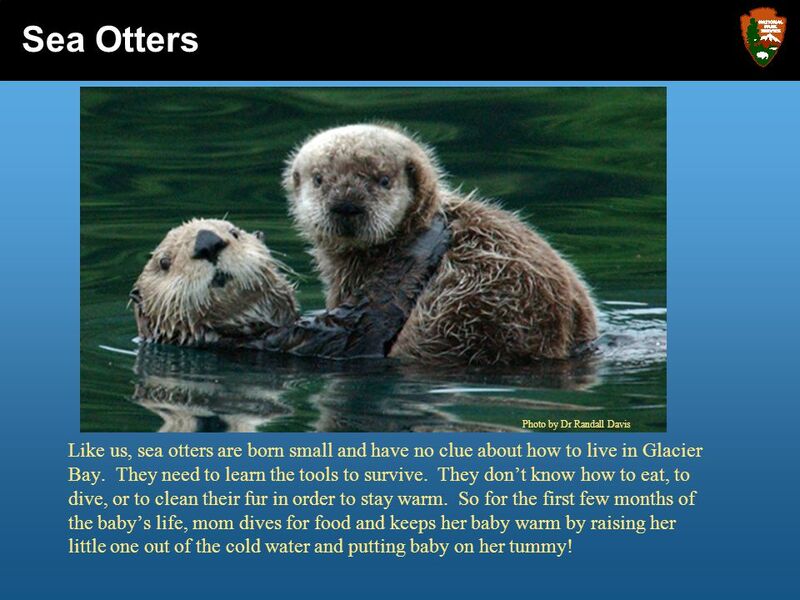 Well sea otters sure do. But their world is always moving, as strong currents carry water in and out of Glacier Bay. 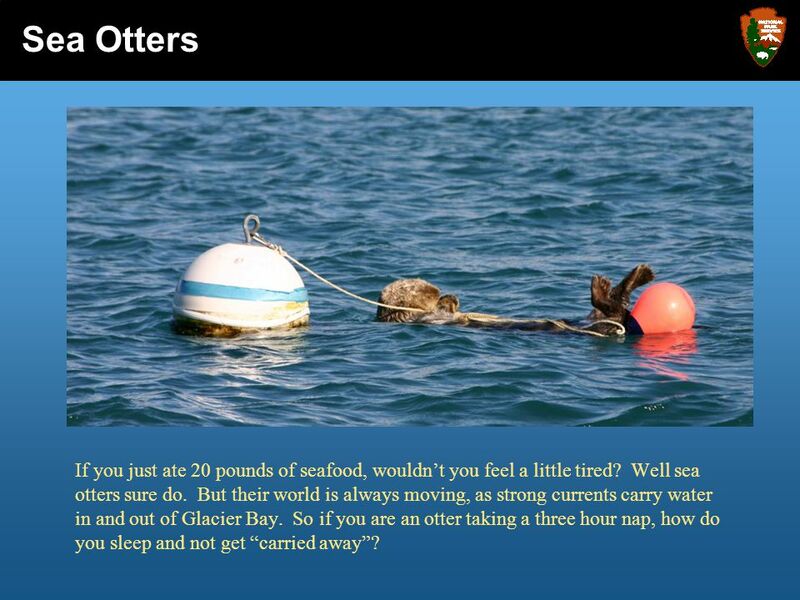 So if you are an otter taking a three hour nap, how do you sleep and not get “carried away”? 12 Sea Otters In order to stay in one place, sea otters typically wrap themselves up in seaweed! 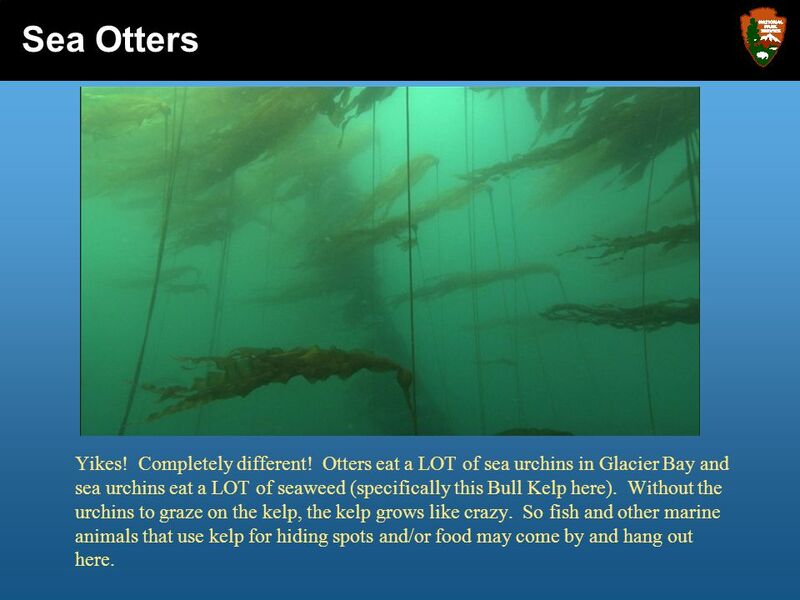 Long tendrils of Bull Kelp that are anchored to the sea floor are strong enough to hold an otter in place. 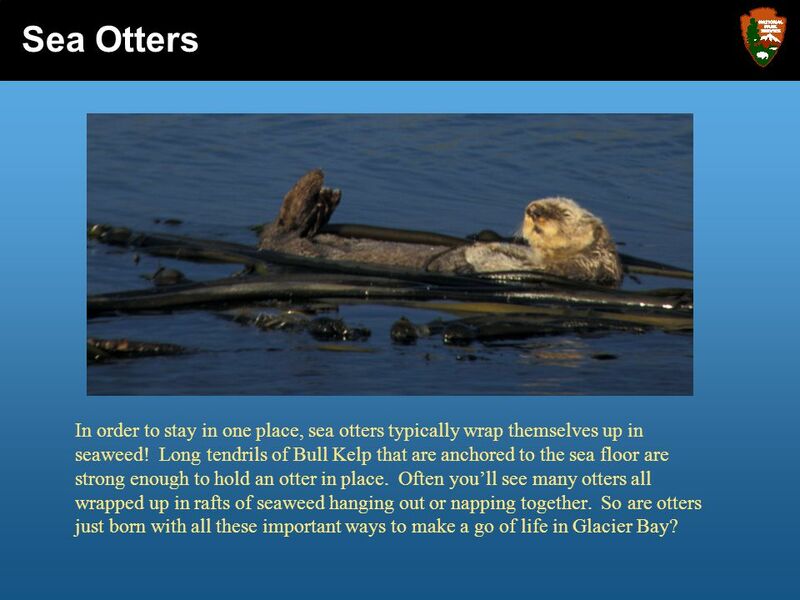 Often you’ll see many otters all wrapped up in rafts of seaweed hanging out or napping together. 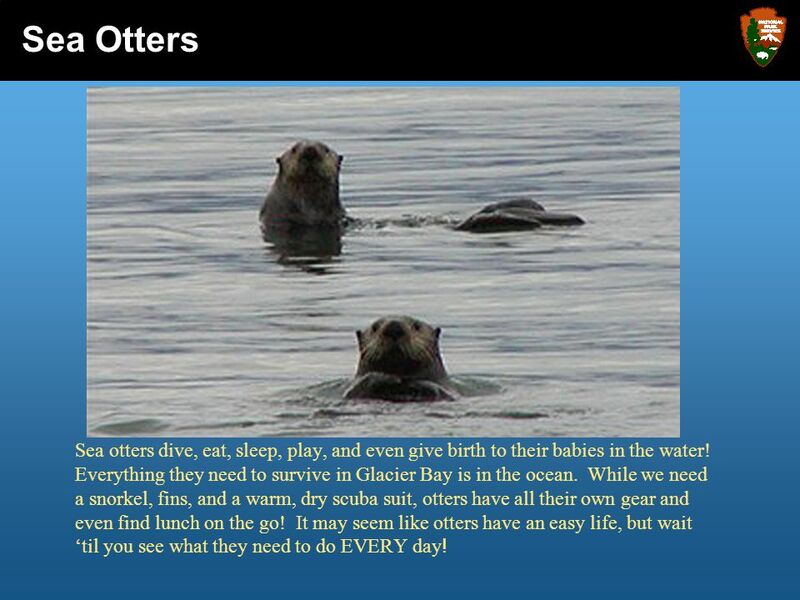 So are otters just born with all these important ways to make a go of life in Glacier Bay? Sea Otters Photo by Dr Randall Davis Like us, sea otters are born small and have no clue about how to live in Glacier Bay. They need to learn the tools to survive. They don’t know how to eat, to dive, or to clean their fur in order to stay warm. So for the first few months of the baby’s life, mom dives for food and keeps her baby warm by raising her little one out of the cold water and putting baby on her tummy! 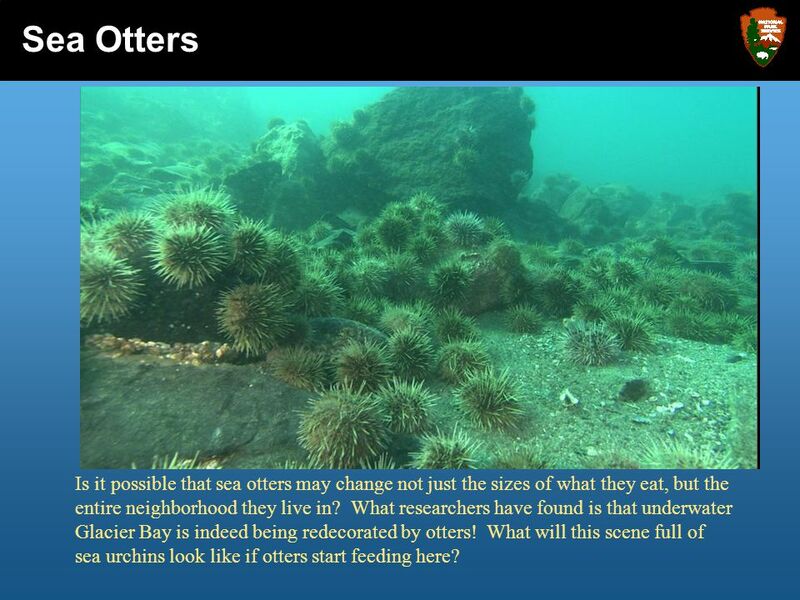 14 Sea Otters There are so many cool things you “otter” know about sea otters and the food that they eat! 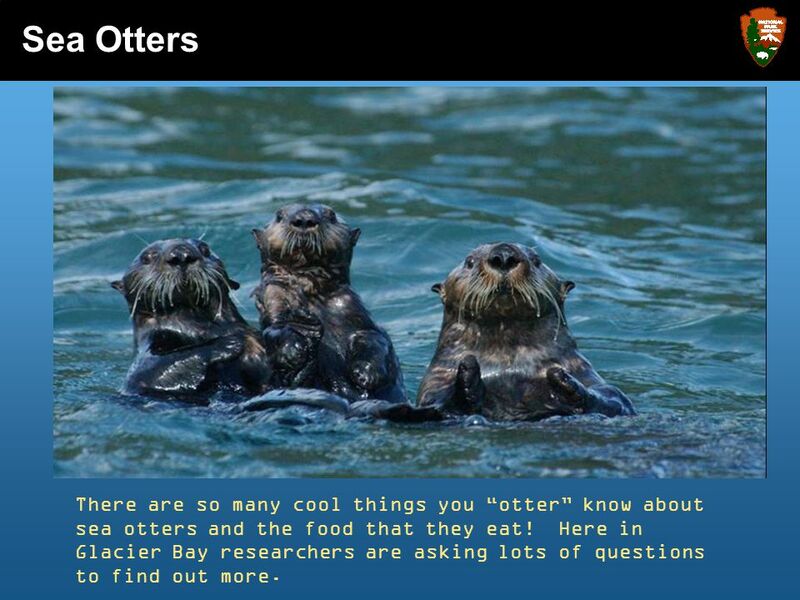 Here in Glacier Bay researchers are asking lots of questions to find out more. 15 Sea Otters If you were really hungry and had to dive down 100 feet to get your food, would you pick up a large meal or a small one? 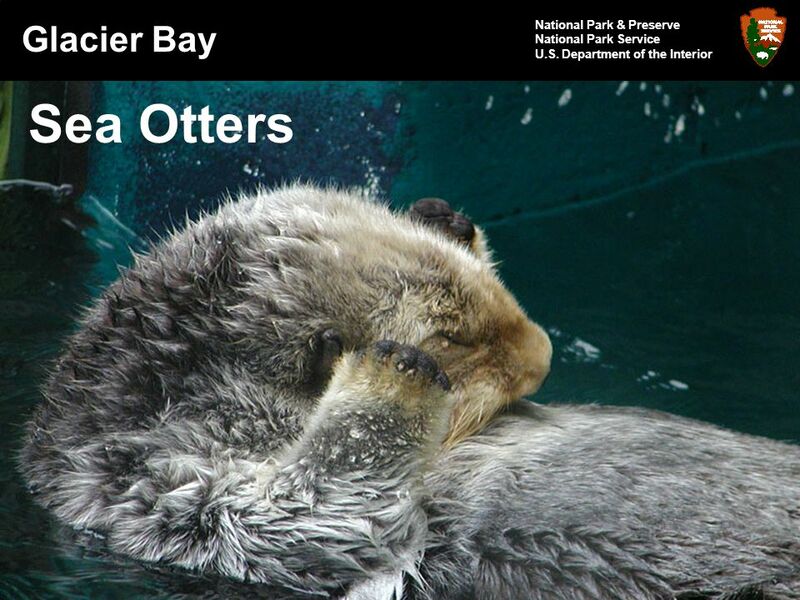 Park researchers have found that sea otters prefer big crabs, clams and sea urchins to smaller ones. As sea otters select out the bigger food items, only the smaller ones are left, thereby changing the average size of all these animals in Glacier Bay. What else can sea otters change? 16 Sea Otters Is it possible that sea otters may change not just the sizes of what they eat, but the entire neighborhood they live in? 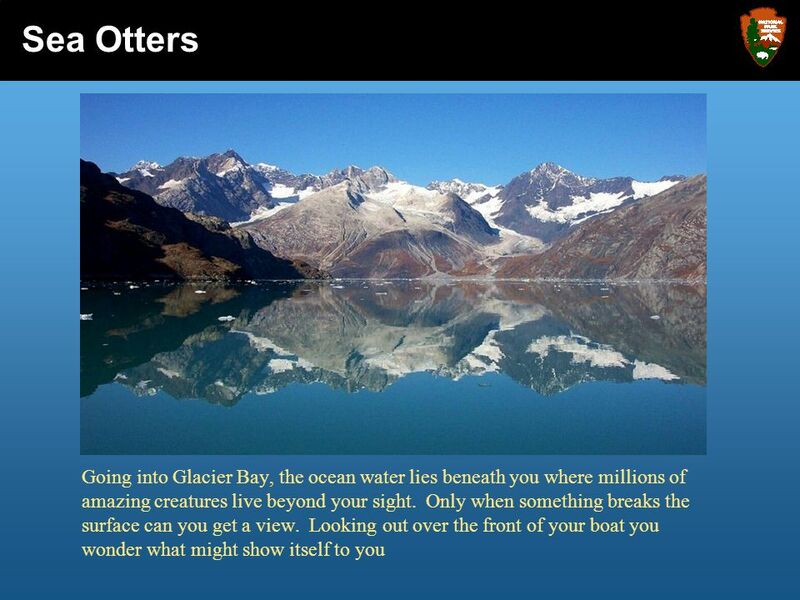 What researchers have found is that underwater Glacier Bay is indeed being redecorated by otters! What will this scene full of sea urchins look like if otters start feeding here? 17 Sea Otters Yikes! Completely different! Otters eat a LOT of sea urchins in Glacier Bay and sea urchins eat a LOT of seaweed (specifically this Bull Kelp here). Without the urchins to graze on the kelp, the kelp grows like crazy. So fish and other marine animals that use kelp for hiding spots and/or food may come by and hang out here. 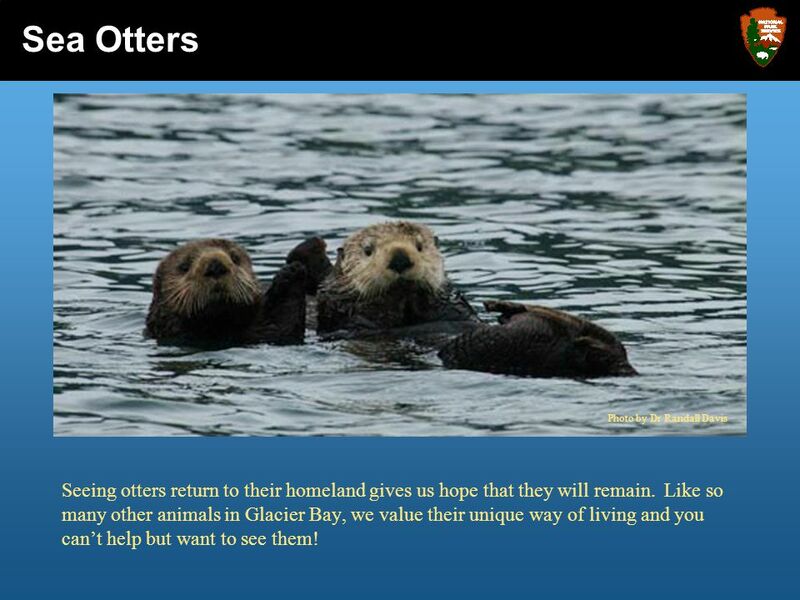 18 Sea Otters There are so many more changes that will happen in Glacier Bay as a result of the sea otter coming back. Researchers are still asking lots of questions. 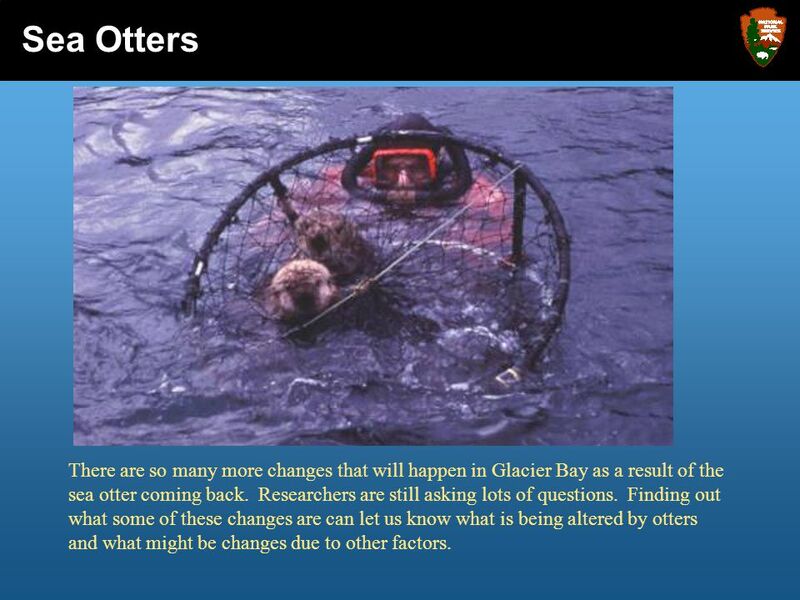 Finding out what some of these changes are can let us know what is being altered by otters and what might be changes due to other factors. 19 Sea Otters Coming into Glacier Bay, people know that there are sea otters here. However, 10 years ago you couldn’t find a single sea otter in the park. 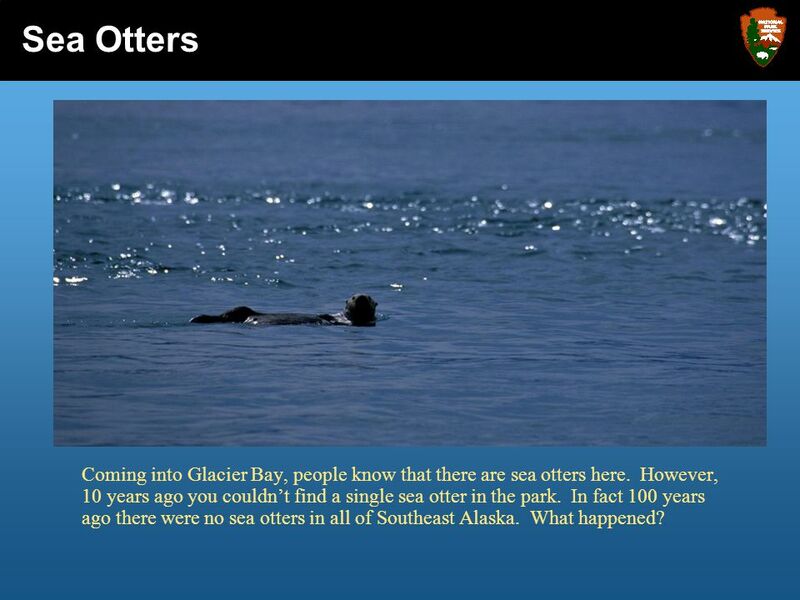 In fact 100 years ago there were no sea otters in all of Southeast Alaska. What happened? 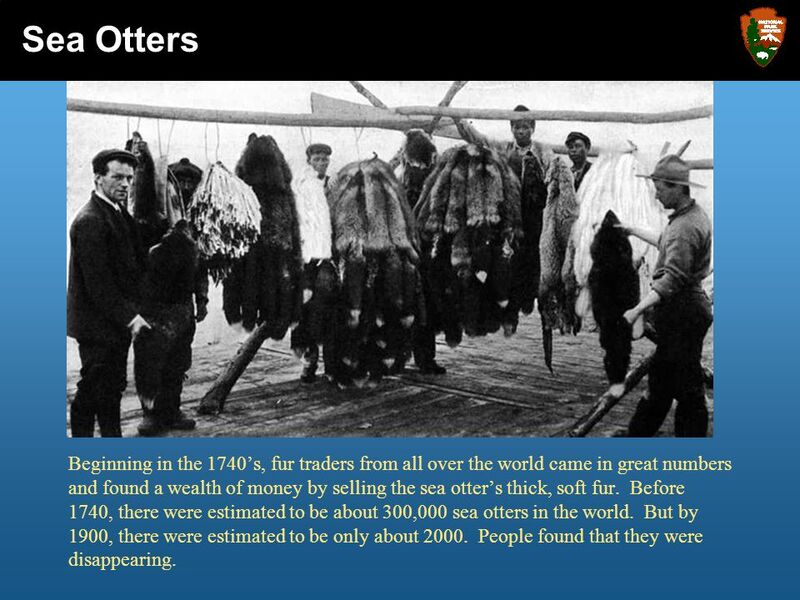 20 Sea Otters Beginning in the 1740’s, fur traders from all over the world came in great numbers and found a wealth of money by selling the sea otter’s thick, soft fur. Before 1740, there were estimated to be about 300,000 sea otters in the world. But by 1900, there were estimated to be only about People found that they were disappearing. 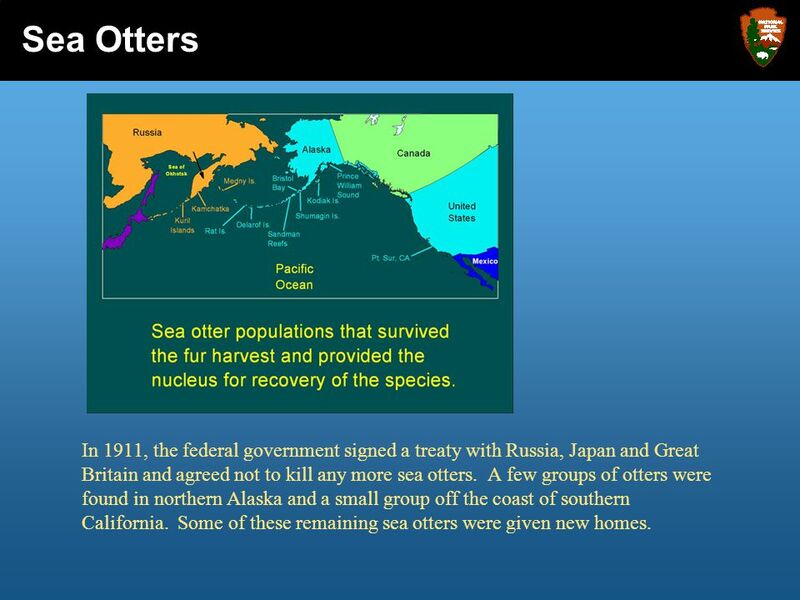 21 Sea Otters In 1911, the federal government signed a treaty with Russia, Japan and Great Britain and agreed not to kill any more sea otters. 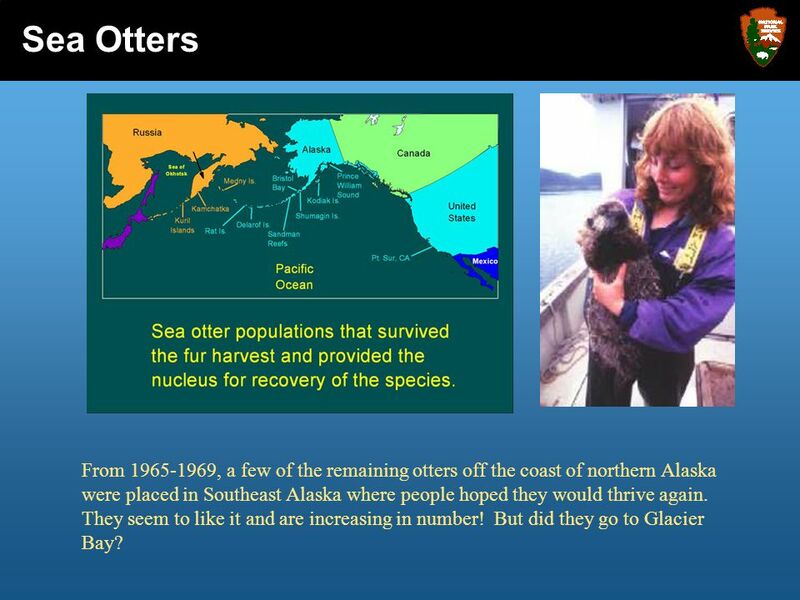 A few groups of otters were found in northern Alaska and a small group off the coast of southern California. Some of these remaining sea otters were given new homes. 22 Sea Otters From , a few of the remaining otters off the coast of northern Alaska were placed in Southeast Alaska where people hoped they would thrive again. They seem to like it and are increasing in number! But did they go to Glacier Bay? 23 Sea Otters Pictures taken from planes flying over the park tell us how many sea otters are here. The first sea otters which came into Glacier Bay in over a century arrived in People were so lucky to even get a glimpse of them. 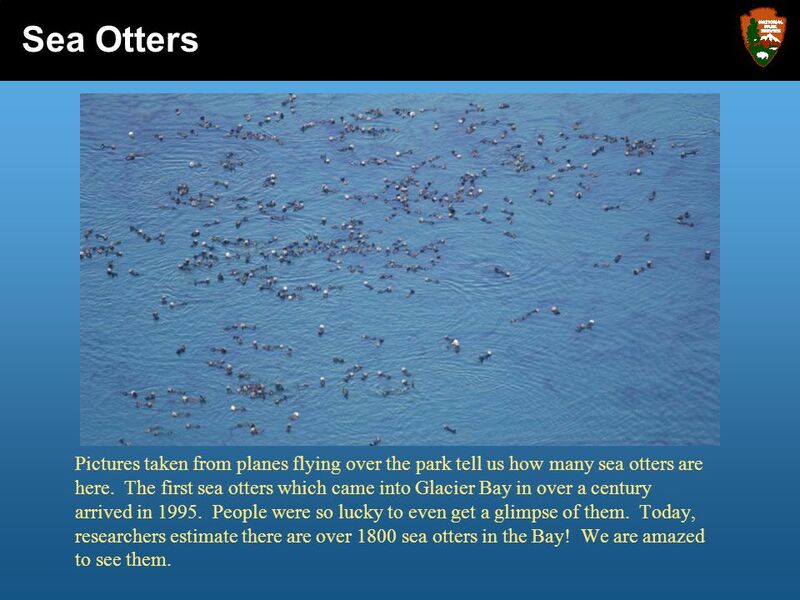 Today, researchers estimate there are over 1800 sea otters in the Bay! We are amazed to see them. Sea Otters Photo by Dr Randall Davis Seeing otters return to their homeland gives us hope that they will remain. Like so many other animals in Glacier Bay, we value their unique way of living and you can’t help but want to see them! 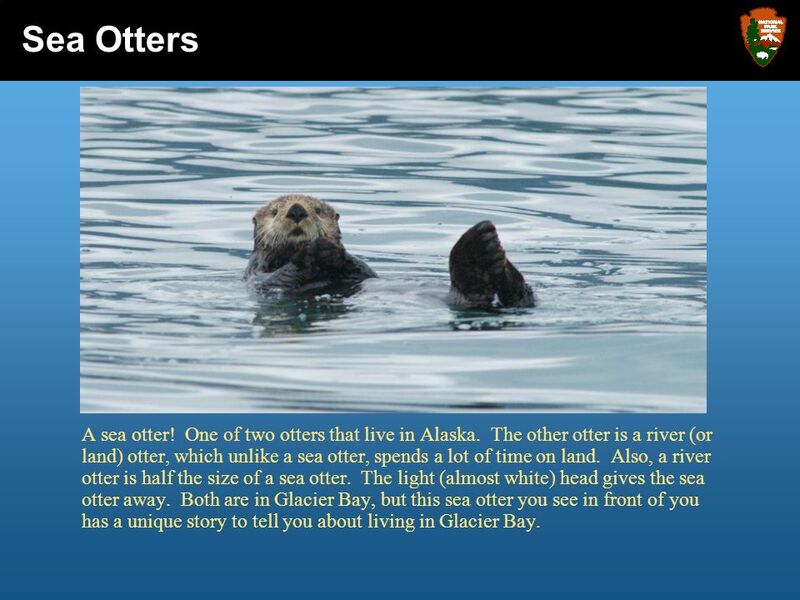 25 Sea Otters In Glacier Bay, you look out at the sea otter in front of you and discover the story it has to tell. They live a life at sea, doing all the same things we do like eat, sleep, study, learn, and play. But how differently they do all these things! As you travel on over the water you wonder who else might break the surface and tell you a story. 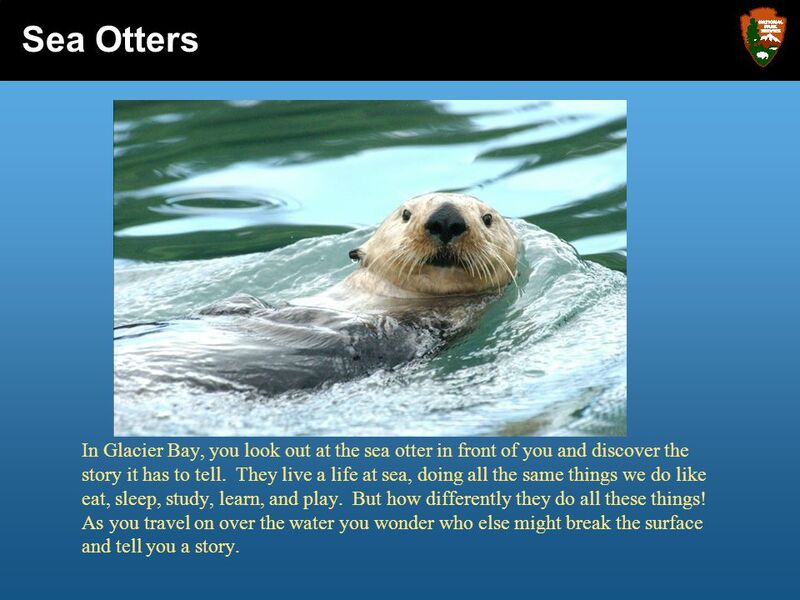 Download ppt "Sea Otters Glacier Bay National Park & Preserve National Park Service"
DOPHINS By Allysia cortez Merriweather. What is adaptation? Adaptation is something that happens as animals and plants evolve. Over time they adapt to the environment they live in, in different. There are five different groups of animals with vertebrates They are : Mammals Fish Reptiles Birds Amphibians. Glacier Bay National Park & Preserve National Park Service U.S. Department of the Interior Pacific Halibut. Glacier Bay National Park & Preserve National Park Service U.S. Department of the Interior The Kelp Forest. By: Daniella Farkash. Sea otters have a small round head, closeable nostril, ears with flaps and small eyes that are good for seeing in and out of the. by, Myles, Doug, roman and Cassandra pics videos. ANIMAL RESCUE. VOCABULARY RESCUED saved from danger I rescued a dog that was caught in a trap. JODY LAURITZEN They are:  Mammals  Reptiles  fish  Birds  Amphibians. Myakkariver.net Photo credit: Keith Ramos, USFWS. The Bald Eagle National Symbol Power Point By: TS. To start presentation Beluga Whale Body Characteristics Body Characteristics Let’s learn about the Beluga Whale’s body characteristics. Beluga whales. EMPEROR PEINGUINS The Flightless Birds By KatieC..